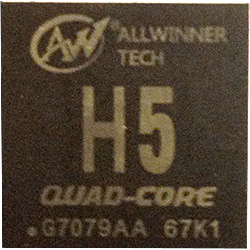 Allwinner H5 (sun50i) SoC features a Quad-Core Cortex-A53 ARM CPU, and a Mali450 MP4 GPU from ARM. See Mainlining Effort and Mainline U-Boot for support status. The initial support for the SoC was added in kernel 4.12 and U-Boot v2017.05. The MMC controller has been updated to support faster transfer modes (HS-400). The MMC clocks have changed on the way, now the MMC controller itself provides support for the output and sample phase. So the MMC controller seems to be closer to the A64. The H3 has SRAM A1 mapped at address 0, the BROM is at 0xffff0000. The H5 (much like the A64) has its BROM mapped at address 0, SRAM A1 is mapped right behind it at 0x10000 (64KB). Pins H8, M5 and T9 are labelled "GND_TV", "HGND" and "GND_CPUFB" on the H3, respectively, but just labelled as generic "GND" pins on the H5. This may just be a naming change. Pin G15 supplies VCC_IO voltage to PortA on the H3 (together with other pins), while it's dedicated to PortC on the H5. This allows to drive the MMC2 with a different voltage (1.8V), to take advantage of the faster HS-400 transfer mode. Pin J12 is one of the "VDD_SYS" pins on the H3, while it's singled out as "VDD_GPUFB" on the H5. There is no pin for "VDD_GPUFB" on the H3. Pin T10 is labelled "VDD_CPUFB" on the H3, but there is neither such a pin nor such a label on the H5. The fact that the H5 uses the (SRAM and BROM) memory map of the A64, but the pinmuxing of the H3 makes it incompatible to both of the chips, especially for bootstrap code (boot0, SPL). Unlike the Cortex-A53 in A64, it is not affected by any critical CatA errata. Featuring 2 vertex shader (GP) and 4 fragment shaders (PP). H5 SoC is supported since v2017.05. See the device specific pages for defconfigs. Linux 4.12 added initial support for the H5 SoC. Features such as ethernet still require official kernel 4.13+ or manual patching. MMC support requires some patches or a 4.9 kernel. This page was last modified on 31 December 2017, at 10:41.